For orders over 20 boxes , please contact us for accurate shipping rates. 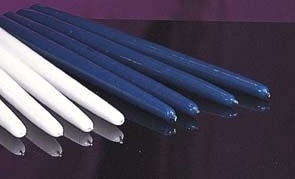 'These 12" X 3/4" Blue Tapers are perfect for making Advent Candle Sets for table top advent wreaths. Sold in boxes of 12. Save your church or school money by buying in bulk and making your own sets. A great fundraising idea! For matching Pink Candles, see product 82702701; for Purple, see product 82702401.